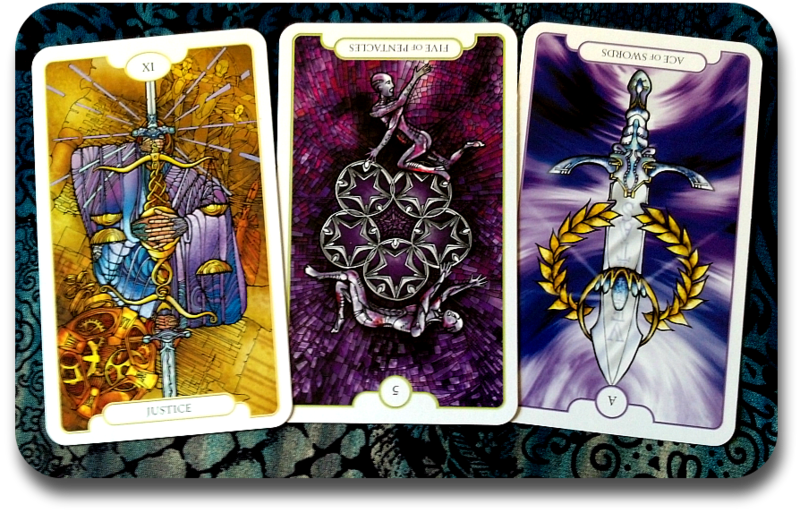 Siddaleah's Tarot Journal: Ready, Set, Action! Enough thinking about how to get out of that rut. Act now, and you will be rewarded for your efforts. Yes, I saw the reversed sword as maybe overthinking something or an idea that lingers too long in the planning stages, procrastination. Justice I see as getting what is deserved, good or bad. Choices have consequences. I definitely saw the reversed 5 of pentacles as someone climbing out of a pit or trying to pull themselves up by their bootstraps, as the saying goes. This was another hard one for me to pare down to just a couple of sentences. I enjoy the process, though, and all of the messages have been very relevant for me.